The latest novel from the celebrated YA author of The Fault in Our Stars focuses on a teenage girl's struggles with anxiety and Obsessive Compulsive Disorder. Turtles All the Way Down, is somehow far darker, not so much because of the subject matter — though that’s dark too — but because of how he chooses to write about it. This novel is by far his most difficult to read. It’s also his most astonishing ... A sweet, conventional love story begins. But it hits a bittersweet, unconventional dead end. Aza can’t kiss Davis without panicking...But the real question is: How does such a story end for Aza? If an author has integrity, it should end plausibly. Green has integrity...I still wasn’t prepared for the ending of this novel. It’s so surprising and moving and true that I became completely unstrung, incapable of reading it to my husband without breaking down. One needn’t be suffering like Aza to identify with it. One need only be human. Everyone, at some point, knows what it’s like when the mind develops a mind of its own. ...like the best of young adult fiction, the book has a deep understanding of what it means to be a teenager ... This is by no means a perfect novel. The mystery and love story and mental health aspects often feel compartmentalised and it is 50 pages too long. Aza can be a repetitive narrator: this may be appropriate for someone who suffers repetitive thoughts, but can make the reading experience frustrating. Some of the recurring mental illness metaphors couldn’t have been hammered harder by Thor himself; it feels as though the illness-as-spiral idea occurs at least once a chapter, and there are more stargazy sentimental Big Moments than at a Coldplay concert. But all this is overridden by the fact that where the author is good, he is very, very good. In short, this novel confirms John Green as a great chronicler of teenage life. He captures the insecurities of youth in the way Judy Blume used to, and he ranks alongside such American masters of teen conversation as SE Hinton and John Hughes ... It will pluck the strings of those in tune with it. It will resonate with, and comfort, anxious young minds everywhere. It might just be a new modern classic. In Turtles All the Way Down, Mr. Green shows the same writerly panache, but there is a bruised weariness in his principal characters that creates a more subdued experience for the reader ... 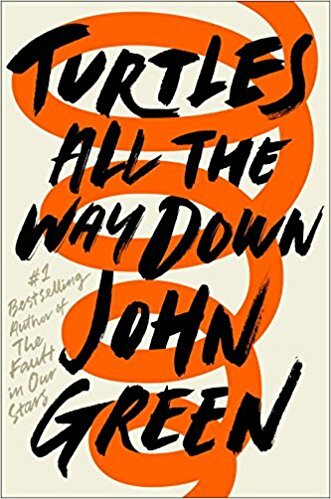 This being a John Green book, the dialogue is snappy and sophisticated, and the characters invested with a sensibility, articulateness and aspirational range of reference that are so appealing to intelligent young readers ... Having wept through The Fault in Our Stars in both its book and movie versions, enthusiasts will want to know: Does Turtles All the Way Down offer the same sort of cathartic transport? It doesn’t, but perhaps it couldn’t. While there is tenderness and wisdom here, and a high quotient of big ideas, too, the stakes are lower, and so the drama is somewhat diminished ... There is arduous and unhappy turmoil aplenty in Turtles All the Way Down, but by the end readers ages 14 and older will find themselves, like Davis and Aza, in a place of hopeful ambiguity. What did you think of Turtles All the Way Down?